The X-Men are getting a big shakeup in the pages of Marvel Comics with two new "monumental" event series this summer. Jonathan Hickman, who wrote 2015's Secret Wars, in addition to acclaimed runs on Fantastic Four and The Avengers, is making his return to the superhero fold after three years away to write these new books, titled House of X and Powers of X. According to Marvel, these are meant to stand side by side amongst the most iconic X-Men storylines in the publisher's history. For the time being, Marvel is playing things pretty close to the chest on this one, as they're not revealing much in the way of plot details for either series. What we know for sure is that both books will be released concurrently, with an alternating weekly release schedule, starting with House of X. An important note; the X in Powers of X actually means 10, so it should be read as "Powers of 10," but the X is there for the sake of branding. Per Marvel comics, here's what to expect from the new books. "Marvel's House of X and Powers of X will mark the next major milestone in X-Men history. Since their introduction by Stan Lee and Jack Kirby over 50 years ago, fans around the world have followed the extraordinary stories of the X-Men through seminal moments like Giant Size X-Men, 1991's X-Men #1, Age of Apocalypse, and New X-Men. Each of these moments introduced a new era for mutantkind, and starting this summer, the world will experience the next seminal moment in the history of the X-Men." Not coincidentally, this announcement, which was initially made at the Chicago Comic & Entertainment Expo, aka C2E2, comes just after the Disney merger with Fox officially closed last week. Previously, Fox had owned the rights to the X-Men and Fantastic Four, which gave Marvel much less motivation to push those comic book titles in a meaningful way. But with the deal done, Marvel Comics looks to make the mutants a major fixture of their lineup once again. Marvel Editor in Chief C.B. Cebulski had this to say about the upcoming titles. "We are excited to have Jon back with the Marvel family, and we could not have asked for a better creative team to help usher the X-Men into a whole new era. While we can't reveal too much about the story just yet, these new stories will redefine the X-Men and their place in the Marvel Universe. This is a historic moment both new and passionate fans won't want to miss." 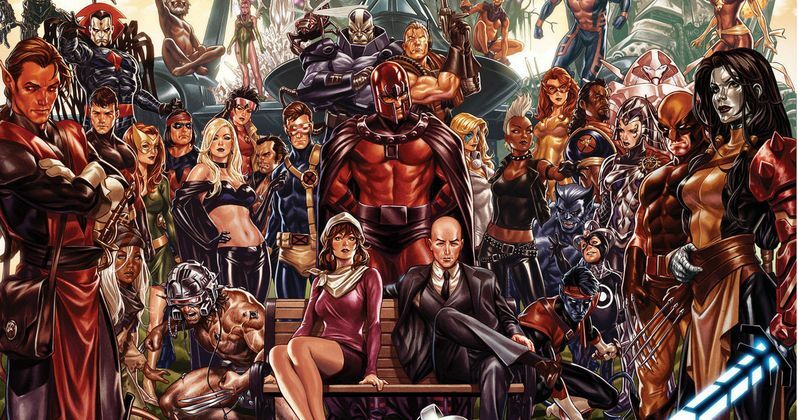 To go along with the announcement, the publisher released an initial piece of artwork, which features a whole host of major X-Men characters gathered together. Unfortunately, it doesn't tell us much, in terms of what to expect, but it looks rather epic in scope. Pepe Larraz (House of X) and R.B. Silva (Powers of X) are handling the art, with Marte Garcia coloring both books. Both titles are set to make their debut in July. This news comes to us directly from Marvel Entertainment.